О чем, зачем и почему? For those of you getting your first university degrees, I like your generation a lot, and I expect good things from you, and wish you well. This is a long-delayed puberty ceremony. You are at last officially full-grown men and women — what you were biologically by the age of fifteen or so. I am sorry as I can be that it took so long and cost so much for you to at last receive licenses as grownups. I have not calculated how much your diplomas cost in time and money. Whatever those ballpark figures are, they surely deserve this reaction from me today: Wow. Wow. Wow. Thank you, and God bless you and those who made it possible for you to study at this great American university. By becoming informed and reasonable and capable adults, you have made this a better world than it was before you got here. Have we met before? No. But I have thought a lot about people like you. You men here are Adam. You women are Eve. Who hasn’t thought a lot about Adam and Eve? This is Eden, and you’re about to be kicked out. Why? You ate the knowledge apple. It’s in your tummies now. And who am I? I used to be Adam. But now I am Methuselah. And who is a serpent among us? Anyone who would strike a child. His example may be of comfort to many of you Adams and Eves, who in later years will have to admit that something has gone terribly wrong — and that, despite the education you received here, you have somehow failed to become billionaires. This can happen to people who are interested in something other than money, other than the bottom line. We call such people saints — or I do. Well-dressed people ask me sometimes, with their teeth bared, as though they were about to bite me, if I believe in a redistribution of wealth. I can only reply that it doesn’t matter what I think, that wealth is already being redistributed every hour, often in ways which are absolutely fantastic. Nobel Prizes are peanuts when compared with what a linebacker for the Cowboys makes in a single season nowadays. For about a hundred years now, the most lucrative prize for a person who made a really meaningful contribution to the culture of the world as a physicist, a chemist, a physiologist, a physician, a writer, or a maker of peace, has been the Nobel Prize. It is about a million dollars now. Those dollars come, incidentally, from a fortune made by a Swede who mixed clay with nitroglycerin and gave us dynamite. Alfred Nobel intended that his prizes make the planet’s most valuable inhabitants independently wealthy, so that their work could not be inhibited or bent this way or that way by powerful politicians or patrons. But one million dollars is only a white chip now — in the worlds of sports and entertainment, on Wall Street, in many lawsuits, as compensation for executives of our larger corporations. One million dollars in the tabloids and on the evening news is «chump change» in 1998. But the cost of a college education, a minor fraction of a million dollars, is anything but chump change to most Americans. Have academic degrees in the past been passports to international glory, to wealth grotesquely out of scale with the needs of ordinary families? In a few cases. Rice can no doubt name a handful of celebrities who came from here. Larry McMurtry I know about. But most graduates from Rice, or from Harvard, or Oxford, or the Sorbonne, or anyplace else you care to name, have been of use locally rather than nationally. They have commonly been rewarded with modest but adequate amounts of money — and even less fame. In place of fame, they may have had to be content with someone’s seemingly heartfelt thanks for something well done from time to time. In time, this will prove to have been the destiny of most, but not all, of the Adams and Eves in this, the Class of 1998 at Rice, and the graduate students as well. They will find themselves building or strengthening their communities. Please love such a destiny, if it turns out to be yours — for communities are all that is substantial about what we create or defend or maintain in this World. All the rest is hoop-la. For your footloose generation, that community could as easily be in New York City or Washington, DC or Paris — as in Houston — or Adelaide, Australia, or Shanghai, or Kuala Lampur. Neighbors are people who know you, can see you, can talk to you — to whom you may have been of some help or beneficial stimulation. They are not nearly as numerous as the fans, say, of Madonna or Michael Jordan. To earn their good opinions, you should apply the special skills you have learned here, and meet the standards of decency and honor and fair play set by exemplary books and elders. It’s even money that one of you will get a Nobel Prize. Wanna bet? It’s only a million bucks, but what the heck. That’s better than a sharp stick in the eye, as the saying goes. This speech is now almost twice as long as the most efficient oration ever uttered by an American: Abraham Lincoln’s Gettysburg Address. Lincoln was murdered for his ideals. The founder of this university, William Marsh Rice, another idealist, was murdered for his money. Whatever! The good both men did lives after them. Up to this point this speech has been new stuff, written for this place and this occasion. But every graduation address I’ve delivered has ended, and this one will, too, with old stuff about my Uncle Alex, my father’s kid brother. 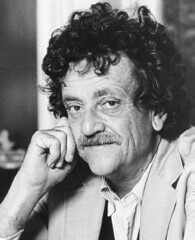 A Harvard graduate, Alex Vonnegut was locally useful in Indianapolis as an honest insurance agent. He was also well-read and wise. So, I hope that you Adams and Eves in front of me will do the same for the rest of your lives. When things are going sweetly and peacefully, please pause a moment, and then say out loud: »If this isn’t nice, what is?» Hold up your hands if you promise to do that. That’s one favor I’ve asked of you. Hold up your hands, please. Now take down your hands and say the name of that teacher to someone sitting or standing near you. If this isn’t nice, what is? I thank you for your attention. Hey, presto! God speed. Запись опубликована в рубрике In English, Что с метками Alfred Nobel, communities, Eden, knowledge, Kurt Vonnegut, money, planet, puberty ceremony, Rice University, time, Wow. Добавьте в закладки постоянную ссылку.